Microsoft beat on both the top and bottom lines. The tech giant said sales growth at its Azure cloud-computing unit slowed. Shares were up more than 3% following the results. Watch Microsoft trade live here. 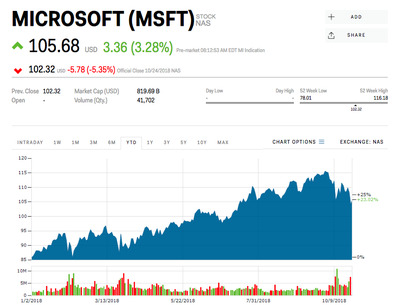 Microsoft was gaining ground ahead of Thursday’s opening bell after reporting fiscal first-quarter results that topped Wall Street estimates but included a slowdown in revenue growth from its cloud-computing unit. Shares were up more than 3% early Thursday after the tech giant said it earned $US1.14 a share on revenue of $US29.1 billion, beating both the $US0.95 and $US27.92 billion that analysts surveyed by Bloomberg were anticipating. And while sales from its Azure cloud-computing unit grew 76% versus a year ago, that was a bit below the 89% pace experienced in the fourth quarter. “A strong quarter (even after adj for demand pull forward) and a F2Q19 guide that brackets consensus,” a team of RBC analysts led by Ross MacMillan wrote in a note to clients after the results were released on Wednesday. “Although comps get tougher in F2H19 (especially on gross margins) we continue to see many sustainable growth drivers.” The team reiterated its $US124 price target and “outperform” rating. Microsoft shares had gained 19.5% this year through Wednesday, but were down more than 12% from their October record high of $US116.18.